Frensham Pond MYG extends a very warm welcome to you for the Videlo Globe Trophy 2019 Footy open event. Come and enjoy racing your Footy at the Frensham Great Pond and help us to create some fun in a friendly, but competitive atmosphere. REGISTRATION and measurement check 08.40 to 09.30 hours. BRIEFING - this will start at approximately 09.40 hours. RACING TIMES - the first race will start soon after the briefing at approximately 10.00 hours - no race will start after 15.00 hours and any race in progress at 15.30 hours will be abandoned. Please make sure that your correct sail numbers are clearly displayed on your mainsails: just the last two digits of your boat’s registration number. 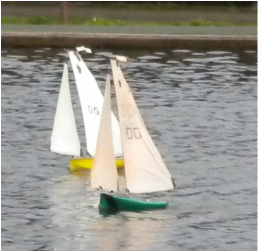 When you bring your boat for registration, please make sure that it will fit in the ‘Footy measurement box’, as required by class rules. Frensham Pond Siling Club, GU10 2QA have a useful guide as to how to find your way on their Website.